An Ian Fleming First Edition of a “James Bond” Book is Big Bucks! FREE APPRAISAL. To auction, appraise, buy, sell or consign an Ian Fleming first edition for up to $30,000, please email Nate@NateDSanders.com or call Nate D. Sanders (http://www.NateDSanders.com) at (310) 440-2982. Thank you. An Ian Fleming first edition of James Bond first edition books. Here are descriptions and prices that we at Nate D. Sanders Auctions http://www.NateDSanders.com have sold. We can obtain up to $30,000 or more for your Ian Fleming first edition today. 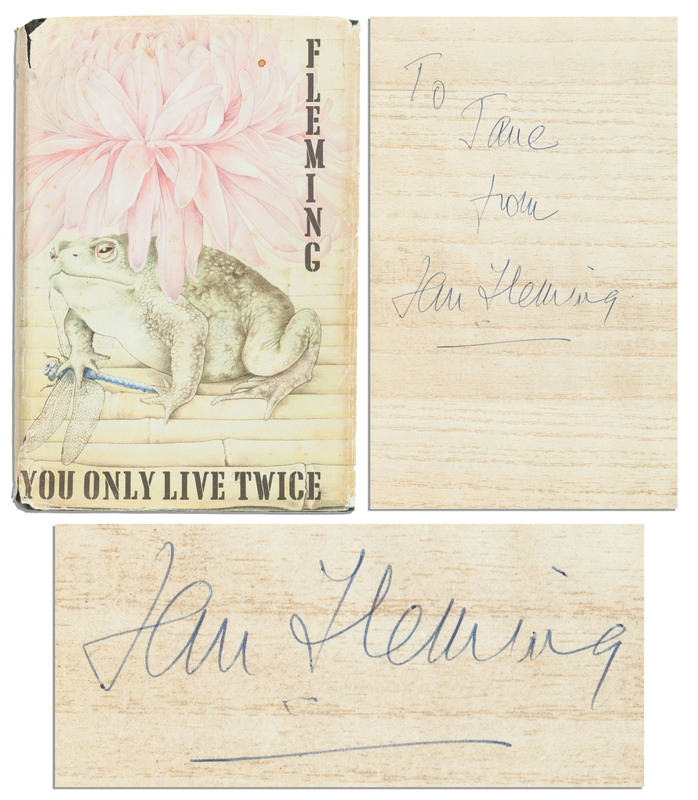 Ian Fleming first edition signed of “You Only Live Twice”, published by Jonathan Cape: London: 1964. Fleming’s autograph inscription appears on the front free endpaper, “To Jane From Ian Fleming”. Second printing of Fleming’s eleventh James Bond novel runs 256pp. Bound in black cloth boards with silver lettering. Measures 5.25″ x 7.5″. Light soiling and wear to boards and cocking to spine. Very good overall. Dustjacket shows toning, some paper loss to spine ends and corners, and remnants of tape repairs to verso. Very good. Housed in a black slipcase. Excellent Ian Fleming first edition. Sold for $7,716.53. 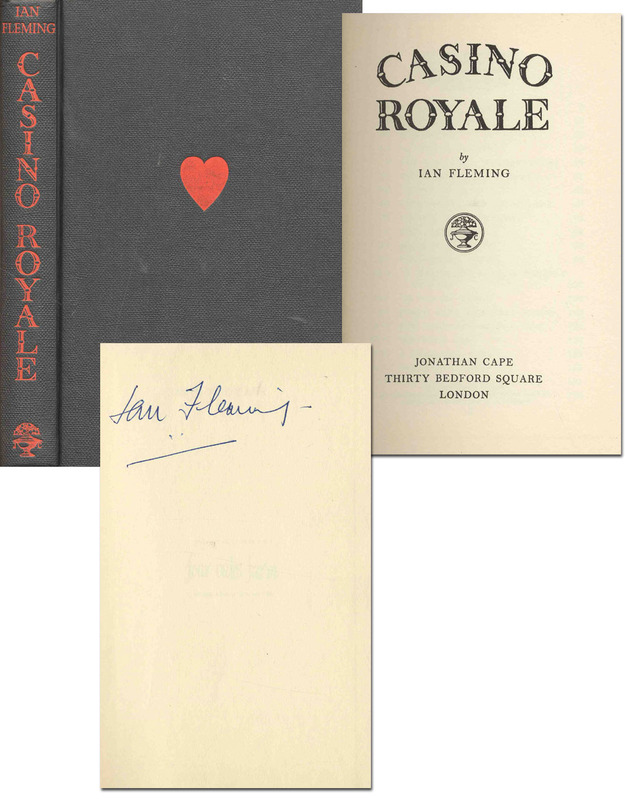 Signed copy of Ian Fleming’s “Casino Royale.” London: Jonathan Cape: 1959 reprint. 218pp. Boldly signed in blue ink by the author to front flyleaf, “Ian Fleming.” Excellent provenance with COA; Fleming signed the book during the course of a potential film deal between he and Stanley Meyer, to whom he gave the book. Bookplate of Stan Meyer on half-title page, and COA from the Meyer Estate also included with lot. Volume measures 5″ x 7.5″. Sans dustjacket. Small crease at spine head, else mint condition. Sold for $3,850. Ian Fleming Signed Copy of “Casino Royale” — With COA & Provenance by Stanley Meyer Estate — Not an Ian Fleming First Edition. Click to enlarge. 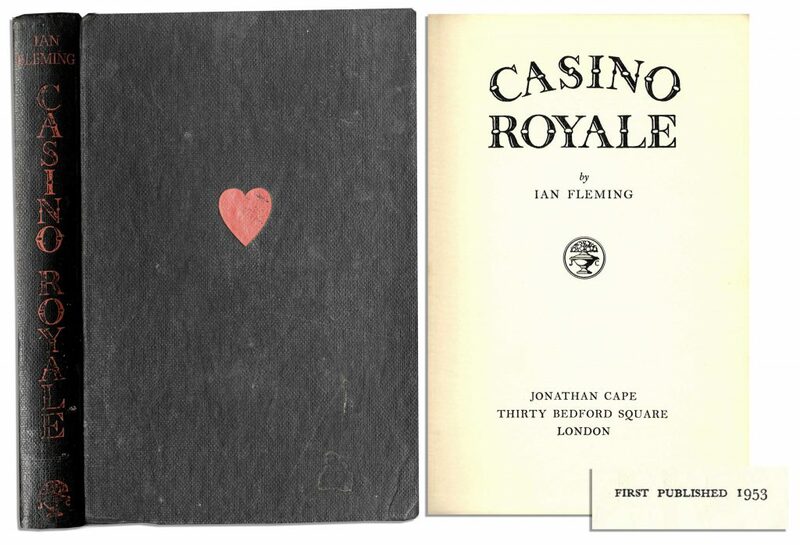 Very rare and desirable first printing of the Ian Fleming first edition of the first James Bond novel by Ian Fleming, “Casino Royale.” Published by Jonathan Cape: London: 1953, with first printing point of “First Published 1953” on the verso of the title page. This first printing is one of only 4,728 copies printed in 1953, and by far the scarcest of all Bond titles. Approximately half of the original copies were sent to public libraries and therefore were either destroyed or bear ex-libris stamps; this copy has remained in private ownership since publication. Bound in the publisher’s original black cloth with red titles and heart decoration to the front board. Without the dustjacket. Book is in very good condition with light shelf wear, slightly leaning spine, and circular spots to the first ten pages or so. Overall, a very attractive copy of one of the most collected books of the 20th century. Great condition Ian Fleming first edition. Sold for $3,151.78. Ian Fleming First Edition, First Printing of “Casino Royale” — the Very First James Bond Novel by Ian Fleming — ScarceBond “was a compound of all the secret agents and commando types I met during the war”. Click to enlarge. FREE APPRAISAL. To buy, sell or consign an Ian Fleming first edition, please email Nate@NateDSanders.com or call Nate D. Sanders (http://www.NateDSanders.com) at (310) 440-2982. Thank you. Top dollar obtained for your Ian Fleming First Edition.